For reliable vehicle protection or convenient storage without building a permanent structure, there is no better choice available than the Shelter Logic 12 x 20 x 10 Peak Style Portable Garage Canopy. For a fraction of the cost of adding a garage to your home or building an expensive storage shed you can have a safe, sturdy structure from ShelterLogic and place it conveniently wherever you need it. This multi-function shelter has a six-rib frame made of 1 5/8-in. diameter steel that is put through a 13 step Rhino Shield process and bonded with DuPont thermoset baked on powder-coat finish. It won't rust, chip, weather, or peel, and you can easily assemble it thanks to the slip connectors. Plus, the cross-rail system securely locks the garage in place, keeping it square and level at all times. 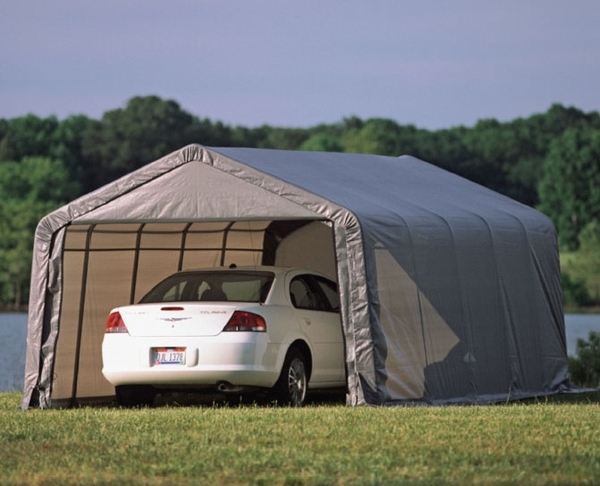 The garage cover is made of a single piece of 9 oz., heat bonded, triple layered polyethylene that is treated with anti-aging, anti-fungal, and fade-blocking agents. It is totally waterproof, tear resistant, and uses Twist-tite technology to tension it to the frame for a wrinkle-free look. Best of all, a white interior lining enhances visibility while you're in your garage. You get wide-based foot pads on every leg and 30 in. auger anchors for stability and simple, step-by-step instructions to help you set it up. Two double-zippered doors make opening and closing the garage a breeze. There's really no downside. For quickness, convenience, and value, the Shelter Logic 12 x 20 x 10 Peak Style Portable Garage Canopy outperforms every shelter or garage of its kind and gives a lot of permanent structures a run for their money. Get yours today. I have a green shelter and the cover is going to heck; can I buy the cover separately? If your unit is Shelter Logic, then you will have to contact them directly. 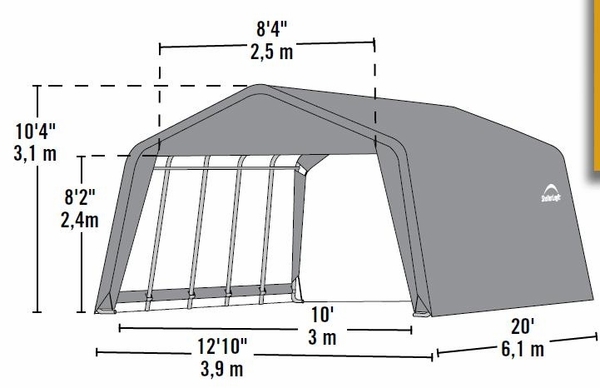 How high is the door of this ShelterLogic 12 x 20 x 10 peak style portable garage canopy? This shelter's door is 8'2" tall. Does this come with two end openings? This unit comes with one solid rear panel and one double zipper front panel. What is the size of the hole in the floor plate and how many are there in each post? Also, how many posts are there? There are 12 posts and the foot pads have 3 eyelets in each foot pad. I do not have the size of the cable that you use in the eyelet but the unit comes with what you need to fully set up. Can I use this as a permanent outdoor garage? Also can this item withstand snow storms? This unit does not have a snow load rating. However, ShelterLogic does produce a 12x20x11 shelter that has a snow load rating. I put this model together, and no matter how much adjusting I do, the zippers are so tight. I struggle to zip open and zip close the doors. I'm afraid they are going to rip/tear if I force them any more. It is more about loosing the webbing of the end pieces or more of an issue of pushing the corners of the shed closer together? Any suggestions? The manufacturer advises: "The best suggestion we have is for the customer to call into consumer support direct for assistance, the information will get to them quicker and they will be able to ask in real time if there are anymore questions. 800-932-9344 ext 2500 Mon thru Friday 8:00am to 8:00pm est Sat and Sun 9:00am to 4:00pm"